This question: How does my trawling / tagging / blogging / processing of hyperlinked content affect my thinking? 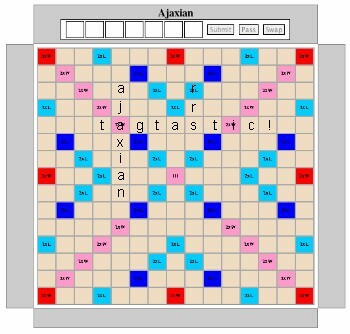 Via Ajaxian, you can now enjoy Wabble, a browser-friendly way of convincing your friends that you didn't just invent the words hunormous or tagtastic. Or, you could try to score more ligitimate big points with hits such as sleazier and grazings. AJAXWorld has reported a couple of interesting data points from Evans Data Corp’s latest Web Services Development Survey (the article refers to the Spring 2006 survey - I think this is a typo as the Winter 2006 Survey has come out). First, The REST (Representational State Transfer) 'style' use is on the rise: The Evans Data survey found a 37% increase in respondents implementing or considering REST. Now, as a mentor of mine once said to me, "X% of f*ck all is still f*ck all", so this data really needs qualifying to understand significance of this, I haven't seen original survey data (but I intend to). I do know that there were 400+ respondents. "with one out of four surveyed saying that they are considering REST-Based Web Services as a simpler alternative to SOAP-based services". So, if you are one of the 3 out of 4 developers that are not considering REST, then you might want to take a look here. Another data point in the survey: close to half of developers surveyed say they are already working with AJAX or plan to do so in the coming year. This story at Redmond Developer News discusses the future of Windows Live as a platform and includes an interview with Adam Sohn, director of worldwide sales and marketing in Microsoft's online services group. "Microsoft's MIX07 developers and designers conference is set for the end of April in Las Vegas, and promises to be the venue where the company reveals more of its plans to make Windows Live into a bona fide platform for third-party developers"
"First, the company is working to present a more cohesive architecture than it has previously for its emerging Live Services businesses "
Sohn: "With the emerging framework, APIs fall into two fairly distinct categories-infrastructure and applications"
"some of the pieces have been delivered, at least in version 1 form. Others, such as the Windows Live Contacts Control, which Sohn describes as providing access to "probably the largest social network on the planet," are still in beta test." "As Microsoft is developing the software needed to make Windows Live work, the company is also dashing to create enough server space to provide Live services on a truly global basis. That is, Microsoft is investing heavily in data centers to support all of those users and their services"
Sohn: "This is a scale game"
...Oh, and they like to see lots of iterations, er, small improvements in the service over time that demonstrates a team’s commitment (Virtual Earth got dozens of little, and some major, improvements over the past three years)." "Developing an architecture around Microsoft's Live services has been and will be a big part of what happens in this coming year and beyond. It may be why Ray Ozzie has been so silent lately. We may find out as early as his keynote at Mix07. " I suspect there will be some more reactions to the RDN article, so I'll update this post if I see stuff of interest. 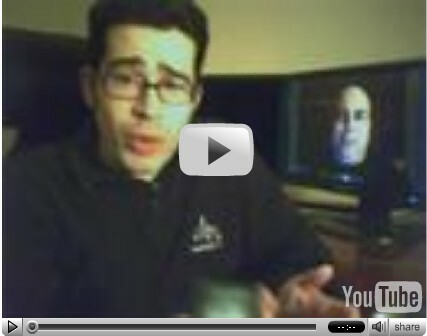 Chris Pirillo has a very interesting experiment going on YouTube. In a series of videos called Help! (here's the latest), he's recording answers technical / PC troubleshooting on his webcam and then uploading those recordings on to YouTube. In the videos he is recording (no music, nothing fancy at all), he's watching the webcam recordings of those questions uploaded on to YouTube by a community of users he's building, offering his advice in those videos and then uploading those to YouTube. What's more, the community themselves are now starting to offer their own answers to some of those questions inline, so there's this kind of self-help PC / technical support YouTube video community emerging. The reach of this experiment is interesting too. One woman all the way from Lancashire (UK) recorded her question regarding a simple way of editing her videos. Forums and newsgroups have been around for a long time, but what Chris is showing me could be the beginning of an interesting format trend in the area of technical support - online video-based technical support networks . Will be interesting to see where this goes. Via Josh Porter's del.icio.us links, I saw this post on Business Intelligence Lowdown, claiming to 'cover the top 10 largest databases in the world'. "you may want to call this the top 10 databases "that we could find."" "This article should have been entitled "An uneducated guess at the top 10 American databases". A couple of weeks ago Dr Peter Chen, inventor of the Entity-Relationship model (ER model), visited the Microsoft Campus to provide a lecture sharing his thoughts on the ADO.NET Entity Framework. As we were planning his visit, he was very keen to make sure that his views could be shared with a wider audience beyond Microsoft employees, so we agree to record some sessions while on campus. The next morning, I picked up Dr Chen from the hotel and drove him to the recording studio to meet with Britt, Jose and Brian Beckman where they got talking for an hour with the microphone on. Here's the podcast, hosted on Channel 9 (.mp3 here) It is superb. I mean it. If you're into 'data', you'll love it. "Beckman interviews Dr. Chen along with Jose Blakeley, Software Architect, SQL Server, and Britt Johnston, Director of Program Management, Data Programmability. Join as we discuss the ideas behind Dr. Chen's original paper, how these concepts have subsequently influenced the software industry and database technologies, and how the ADO.NET Entity Framework is an execution runtime for the ER model." Rich Hoeg, a Honeywell employee whose blog 'econtent' I've been following for a while, is helping rural children in China by running a marathon to raise money for the China Tomorrow Education Foundation. The charity's mission is to help the children of remote villages in China obtain a basic education, escape poverty and seek a brighter future by retaining their elementary schools and support local education-related capital projects. "Please consider sponsoring me for Grandma's Marathon and my Run for Chinese Education. Not only will I be putting the proverbial feet to the pavement ... for 26.2 miles, but I am also contributing $600 of my own money." 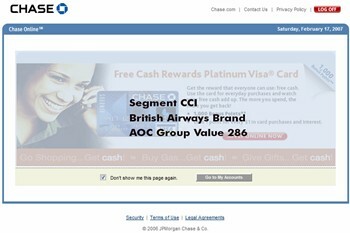 Chase.com - is this your idea of transparent marketing? This ad popped up on the Chase.com site this morning. Overlayed is what looks like internal codes from their customer segmention model. Either this is shown in error, or, Chase is taking the notion of transparent marketing a little too literally. Congratulations to Michael Gartenberg who's moving from an analyst role at Jupiter to an evangelist role in Jeff Sandquist's group at Microsoft (the same Jeff who nabbed Jon Udell recently). Within the comments of Michael's announcement, there are disappointed voices, the sentiment of which is that Michael will lose his subjective view of Microsoft in his commentary relating to Microsoft and therefore his views are less valuable. There's a bit of the the old "you've turned to the dark side" point which isn't surprising to hear but I think there is a serious point to consider within the comments. Not a real shocker (never lost money yet betting against a Microsoft ship date) but MSFT is holding off on the Vista launch until January. It will also be interesting to see how the competition in Cupertino capitalizes on the delay." It is arguably this kind of post that made Michael 'readable' - opinionated, some insight and to the point. The question here is how will his commentary change now he's employed by Microsoft as an evangelist? Of course, it will change in terms of the focus and attention he lends to Microsoft products (at his new personal blog), but, will he lose his a) ability to forthrightly criticise Microsoft when he sees something broken, and b) sense of objectivity regarding not just Microsoft but it's competitors? The commenters that are now informing Michael that they are unsubscribing to his RSS feel the answer to both these questions is 'Yes'. The challenge for Michael, or any other voice that is recruited by a company because of their voice, is to prove those folks wrong. Good luck to Michael, and once again, nice one Jeff. At the end of 2005 I wrote a post messing around with some ideas on the future of the net. One of the ideas was the counter concept to the Darknet, using the term 'Lightnet'. I didn't define 'Lightnet', Lucas Gonze did that (and soon after Lucas was good enough to acknowledge me with credit for the invention of the term in the Darknet context). A few days later, Lucas and J.D. Lasica were both interviewed by Jason Boog for an article Jason published at Publish, where Clay Shirky was also asked to comment. February 2006 - Chris Ritke confrims Lucas is adament: "one lightnet but many darknets"
February 2007 - DTLQ believes in lightnets. Raymond wrote that today, 15 months after lightnet's birth. "While previous releases have been tested by 1000+ Microsoft employees and some of our hardware and software partners, we are now starting to invite a broader group of external testers to participate in Beta 2." You can sign up here (no places guaranteed) and peruse the Windows Home Server Forum. In case you've not heard about Windows Home Server but want to learn more, check out stopdigitalamnesia.com and this post describing a short history of the product's development. "Usage scenarios can include a combination of communications services, such as e-mail, instant messaging and document collaboration, with Web services, such as Windows Live™, Microsoft MapPoint®, Amazon, eBay, Google and Yahoo!" I've not heard someone say "I'm confused" for a while now. I find it to be a confrontational phrase and I dislike it. I intepret it as someone trying to make a point along the lines of "I'm smarter than you, and what you just said doesn't make any sense to me". Aware of the way it makes me feel when someone does say it, I try to make sure these words don't pass through my lips in conversation. Me: "I see. What part of the word "x" didn't you understand?" Me: "Not for the first time..."
Me: "I've heard that about you"
Me: "You know, I'm not sure this is the appropriate time to discuss personal issues."